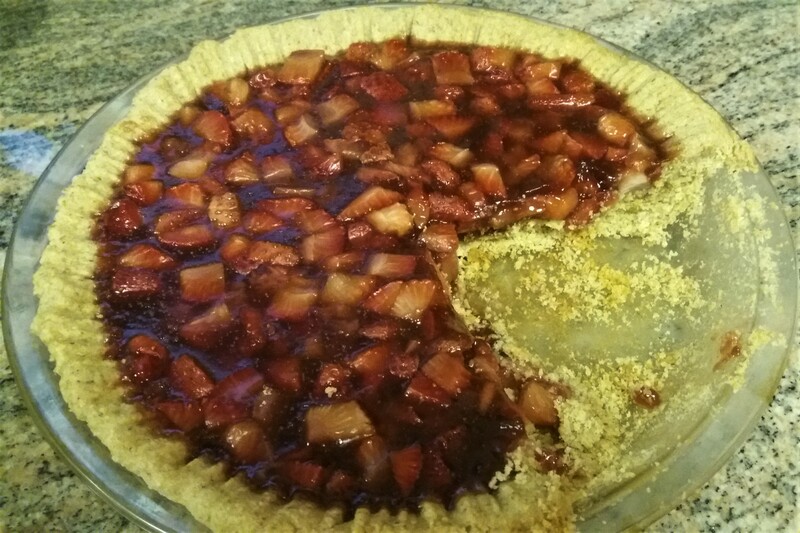 This is a delicious berry pie and the crust is gluten free! Preheat oven to 350F and grab your favorite 9-inch pie dish. Place the oats and almonds in a blender or food processor and pulse until pulverized. In a large bowl, combine oil, maple syrup, water and pinch of sea salt. Add the oat and almond mixture to the wet ingredients and mix well by hand. Grab your favorite 9-inch pie plate or glass dish and press crust into it. Bake at 350F for about 10 to 15 minutes. Place 2 tablespoons of black cherry juice in a small bowl, add kuzu and stir to dissolve. Set this aside as you will add it to the sauce pan in a moment. Place black cherry juice, agar agar flakes and pinch of salt in a sauce pan. Bring to boil while constantly stirring to dissolve the flakes. Add maple syrup, vanilla and balsamic reduction. Add cherry juice and kuzu mixture, which you previously set aside, to the pan bringing it back to a gentle boil and stirring to thicken. Add strawberries and lemon juice. Cook for a few more minutes. Pour it out into the pie crust and let cool. Enjoy!